Snapshot of a Music Tourist — Toque & Canoe interview the force behind Canada's new national music centre. National Music Centre President & CEO Andrew Mosker / Photo by Leblond Studio Inc.
A few days before the official Canada Day opening of Studio Bell, home of the National Music Centre, a handful of media and more than a few special guests gathered to mark the occasion. Casey Eagle Speaker led the event with a Blackfoot blessing, which was followed by drum group Eya-Hey Nakoda—marking the first “official sound” performed inside the architectural marvel that is Canada’s new home for music. Extraordinary inside and out, the building—a combination of performance hall, recording facility, broadcast studio, live music venue and museum—looks like it’s been hand-plucked from the wildly imaginative urban landscape of Barcelona, Spain. Or, if you’re into comic strips, the structure, boasting nine interlocking towers, could double as a super hero’s secret lair with its steel frame cloaked in 220,000 hand-placed terra cotta tiles, manufactured in Germany and custom-glazed in Holland, giving the appearance of chain mail or even dragon scales when observed from afar. At this small ceremony, Calgary’s much-loved mayor Naheed Nenshi maintained, passionately, that Studio Bell “is a gift from our community, to our nation.” Newfoundlander Alan Doyle of Great Big Sea fame sang his charming heart out in celebration, and Blue Rodeo’s Jim Cuddy followed with one of the most joyful solo guitar performances I’ve ever seen. Q: You call yourself a music tourist. What do you mean, exactly? A: I grew up in a large Italian family. I was the quiet one. I found great solace and comfort in music from a very young age. Eventually, when at 21 I realized I was never going to be a professional baseball player, music began to govern every aspect of my life—professionally, personally and academically. I became fascinated with how it’s made, recorded, composed—even with how it’s disseminated. Music also informed most of my travel. When you think about it, music and travel are a beautiful pairing. Everywhere I went, I ended up in record stores and music shops and in places where I could hear local bands playing their own tunes, singing songs about their neighbourhoods. The venues they played, and continue to play, are keepers of the stories of those communities. I’ve always gravitated to those places. The Stax Museum of American Soul Music in Memphis, Tennessee, for example, is huge inspiration for the National Music Centre here in Calgary. Q: Tell us more about the inspiration for the National Music Centre. A: I’m from Montreal but I’ve lived in Calgary for 20 years, in the inner city. I’ve walked to work most of my life. 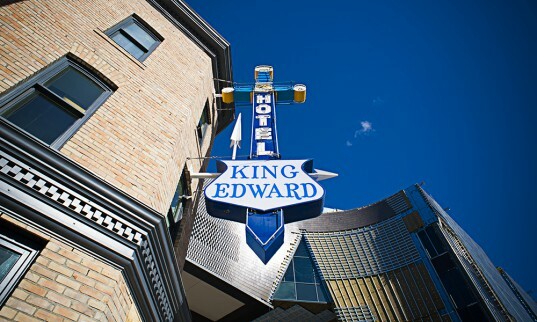 When I saw what The Stax Museum does in Tennessee—the recording studio, a charter school, a museum inside, a community gathering place, using the power of music to inspire good deeds within the community—I started thinking about Calgary’s East Village and the historic King Eddy Hotel. [Built in 1905, it was famous as a blues venue in the 1970s and 80s]. The key was to build something like Studio Bell in a sacred place so it actually means something. 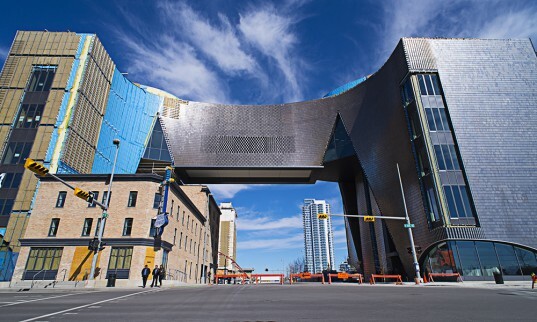 I felt very strongly that the National Music Centre be grounded in an authentic Calgary music story and the King Eddy, an iconic live music venue that had closed down, needed repurposing. It’s now part of Studio Bell and is the largest piece in our collection. Q. Everyone’s raving about Studio Bell’s design. What more can you tell us about it? A. Sixty-six architects applied for the job. The guys that got it, Allied Works Architecture, understood our core elements, our core values. They understood our vision, sometimes even better than we did. And they had the right experience; as in, they are involved primarily with cultural projects. They are artists and artisans and craftspeople and they have a lot of experience with repurposing historic buildings. Q. 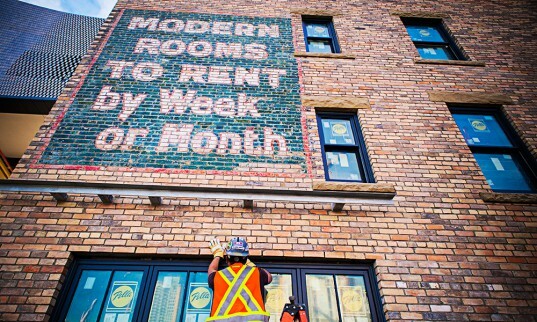 What does this project mean for Calgary? A. That we’ve put a stake in the ground when it comes to music. That we take music seriously, so seriously we invested, with the help of donors at every level, $191 million in an outstanding piece of timeless architecture. If the National Music Centre matures into what we dream it will be, it will be one of the finest musical organizations in the world. Q: What, in your view, is going to make the National Music Centre a success? A: There are so many pieces to this picture. Live music is going to be very important. 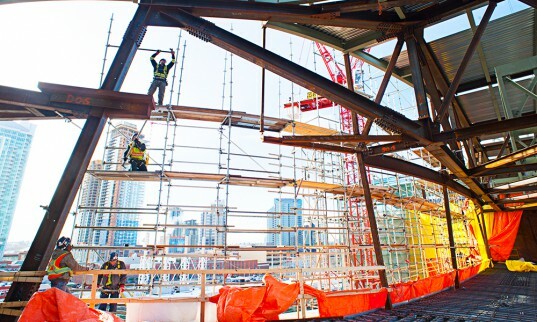 Once we build it up, we’ll be a seven-day-a-week live music facility. This will be a huge draw. We’ll develop great programming and offer exhibitions that amplify stories featuring the incredible things that Canadians from all walks of life have contributed to music. We’ve got a collection now that spans 450 years of music history and technology. [Examples include everything from one of Stompin’ Tom Connors’ wooden stomping boards to Alanis Morissette’s harmonica to internationally significant collectibles such as the Rolling Stones mobile recording studio and TONTO—one of the largest analog synthesizers in the world]. We want to incubate bands and artists. We want to host thoughtful discussions about the future of music. Every music genre will have equal weight around the table, reflecting the diverse interests and backgrounds of Canadians themselves. Q: Your passion for this project is infectious. Those who’ve joined you call it the “Mosker virus.” Tell us about what drives you. A: As cheesy as this sounds, I believe I was put on this earth to foster and champion music. Again, I was raised in an Italian Catholic family. I’m blessed with a European work ethic. I’m guided very deeply by spiritual things, less so by commercial things. I’m also a rule bender, pusher and breaker, an innovator and disruptor. Making the National Music Centre a reality was the job of many people—from funders to believers. Our work isn’t done. The future begins today. We have an extraordinary building and now, we have to breathe life into it. Editor’s note: This post was produced in an arms length collaboration with our partners in travel at Tourism Calgary. It was not reviewed or edited by our partners before publication.